This is my uncle Don, brother of my mother. Uncle Don lives in Alaska, Michigan (suburb of Grand Rapids), and is perhaps the reigning king of our families one-liners. I remember as a kid, at the Thanksgiving table, Uncle Don, and my brother Doug, would sit at the table and fire off one-liners left and right. It was as though the two of them prepared for months for this annual dual. It brought me joy to watch their faces as they would smirk with glee at each barrage. I can hear the laughter of my grandmother. As you might expect, my Uncle Don has taken to spreading his love of rib-tickling to the Internet with his occasional e-mails. I received this from him today, and thought I would share it here. Even though the Michigan economy is greatly struggling, my Uncle Don is able to poke you in the rib, and squeeze a laugh out of you. I am beginning to see friends in Michigan celebrate, as they come out to greet the Spring. When I think of springtime, in Michigan, I always think mostly of the transition period between winter and spring, when the maple sap starts flowing. My grandfather would harvest vast amounts of sap each year, from the maple trees around his yard, in Alaska, Michigan. He would collect this sap, take it to the Quonset hut, and begin the long, tedious process of boiling down the sap. It would take 14 40 gallons of sap, to make 1 gallon of maple syrup. I have very fond memories of helping my grandfather collect the sap, and staring in wonder as the sap boiled over the hot wood fire. This was also the place where my grandfather would sneak cigarettes. I was always given a stern warning, "don't you tell your grandmother!" My grandfather is long gone. It has been a very long time since I have enjoyed grandmother's home-made waffles, with grandfather's home-made maple syrup. I wonder, will there be maple trees, and maple syrup in heaven? Just to gaze upon your beautiful countenance, and allow even the slightest pondering of my love for you, instantly ushers me to tears. Most certainly, God was at his best when he sculpted your image, but it is your heart that I most adore. It is your eternal soul that captivates me. Ours was a relationship born out of individual ruins, to emerge, with the healing hands of God almighty, into the most beautiful of loves. Daily streams of prayers arise to my Savior King for the pleasure of your company. I watch you, in this great change of direction in our lives, to see your bloom becoming even more arresting. It dumbfounds me, incessantly, see regard your developing beauty with each passing day. Infinitely more, I study with great joy, your growing desire to be more like Christ, and see blooming in you, a wonderful role model for those women, daughters-in-law, and granddaughters who are certainly most pleased to be in your acquaintance, and in possession of your giving heart. Thank you, so very much, for loving me for the past 23 years. Thank you for your discriminating understanding of what love really is. And I pray for God's continued blessing in our lives, and most of all, look forward to spending eternity, with you, enjoying God's unending surprising joys. I am dreaming that God would have us, together, manage a very large land together in heaven. Let's continue sanctification's journey, and I look forward, with the greatest of expectations, the further infinite joys that God has for us, as his elect. Yesterday we journeyed to Las Vegas for GodBlogCon (God Blog Convention). Las Vegas is a beautiful 5 hour drive from our home so we decided to take the mountainous drive rather than mess with the airports. From a practical point of view, we probably get to our hotel quicker driving. We left a day earlier than necessary for the conference, as we were having a surprise 80th birthday party for my wife's father, David Wells. 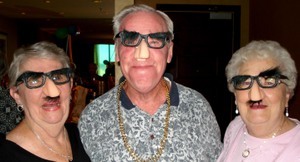 Above is my wife Carol (on the left), and her sister Beth sporting their goofy masks with the 80 year old birthday boy in the middle. In all 16 members of the family made the trek, across the country, to make for a wonderful surprise party for the elder statesman's surprise party. As you can see, from the group photograph, I use the word "statesman" with a significant amount of tongue and cheek. 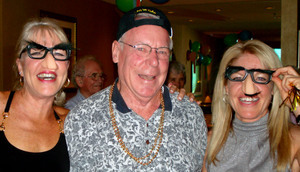 Here we have the birthday boy with his two sisters, Dot & Martha. 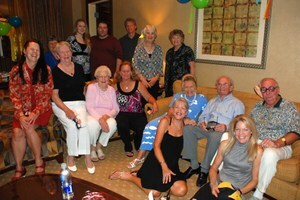 All in all, we had a wonderful visit with family and now look forward to the upcoming convention. Tonight we attend an opening reception dinner put on by the Family Research Council. I will reconnect with you tomorrow to share more of the details of GodBlogCon. In the meantime, I feel a nap coming on. The beds here, in the new Trump Las Vegas Hotel are very, very cozy!